Oh yes that’s right. 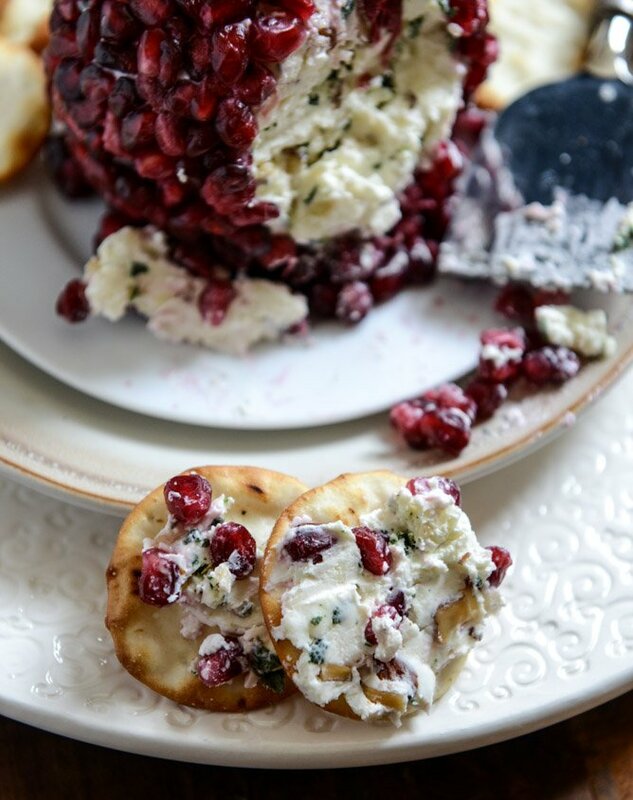 Is there any other time of year where we go crazy over appetizers and snacks and entertaining goodies? Not quite. It’s pretty much one of my most favorite things ever. 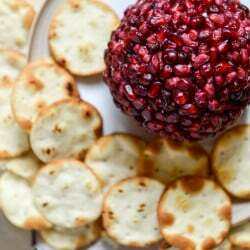 So much so that about five minutes after I started this blog back in 2009, I did a holiday appetizers 101 entire MONTH. Yeah. Like as if people didn’t know what appetizers were. Cringe worthy and laughable and awesome. I’m all about apps. Uh, the ones you eat. Not the phone stuff. Remember ten years ago or so when we could say “apps” and people would automatically know we’re talking about cocktail hour? Yeah. Now it’s like you mention that word to anyone under the age of 20 and you’re immediately discussing cell phone time-sucking things. Seriously. Why am I so old? But whatever – not only am I all about apps but I’m all about calling them apps too. Drinks and apps! Let do it. Invisible internet friend happy hours. I mean hour. I think. Now the thing is that this cheeseball is practically sacrilegious in my family’s eyes. See, my grandma (not Mother Lovett, my other one) always always always made a classic cheeseball that my mom still makes today. 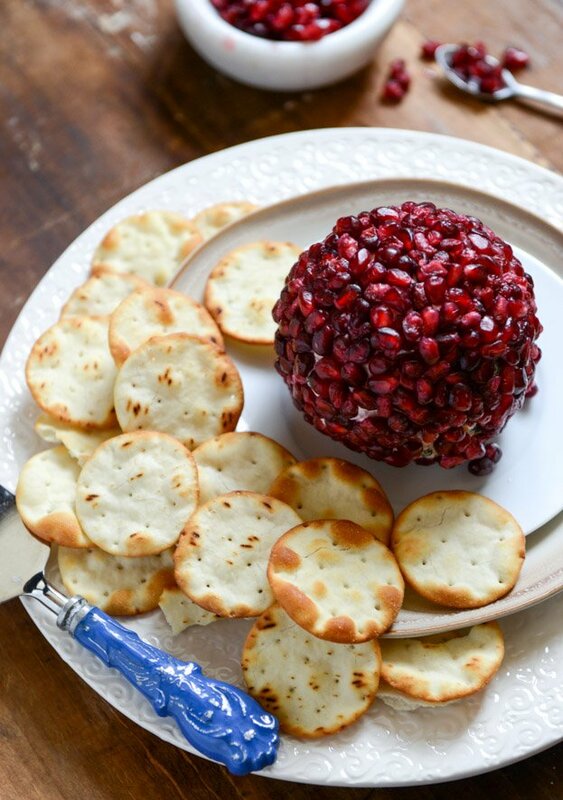 Their cheeseball is a classic staple – never a party goes by without the same cheeseball. This is why they want to punch me in the face. Because I never want to keep things the same and always want to try new stuff. Or actually, if I could have it my way I’d love to have a combination of half of the same stuff and the rest new stuff. New weird stuff like a ball of cheese covered in fruit gems. And it is not boring whatsoever. I jammed a lot of things that I love inside of this cheeseball. I mean, a lot. First up, sharp white cheddar. Use a GOOD sharp white cheddar. It’s worth it. Use your favorite. Next, toasted almonds. Obviously you know by now that I can’t stop eating the Trader Joe’s honey roasted almonds. 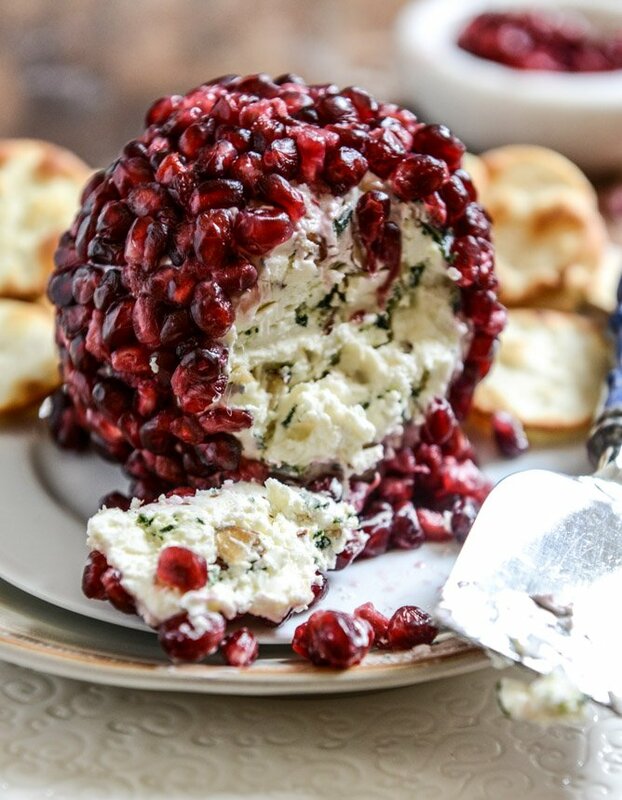 When added to the cheeseball, they get crushed and boost the flavor. If you don’t live near a Trader Joe’s, simply add sliced almonds to a saucepan and toast over low heat until golden and fragrant. There ya go! And finally – some crispy sage with residual brown butter. GAH. Just stop me please. I used a combo of cream cheese and mascarpone and practically had to handcuff myself from going at it with a spoon. 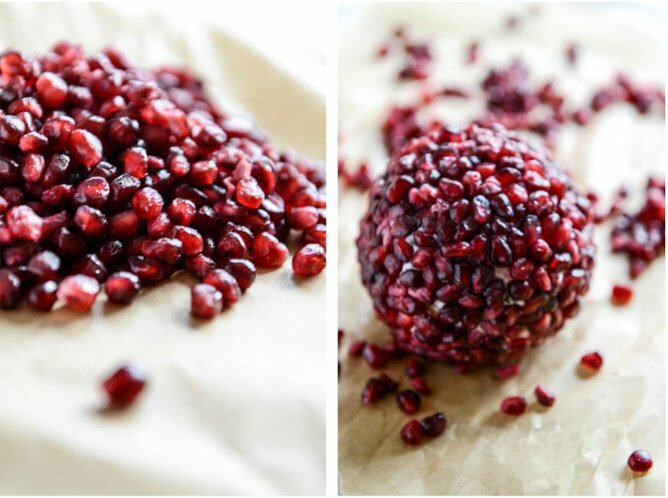 The pomegranates aren’t just for show either – they add the perfect hint of sweetness. While this made it’s debut on Thanksgiving… I think it reigns supreme for the fancier holiday season. Even add a little green in there? Serve it with these margs? Heat a skillet over medium heat and add butter. Once it’s sizzling, toss in the sage leaves and cook until crispy – flipping once and cooking about 1 minute per side. Remove the sage leaves and place them on a paper towel to crisp up a bit. Set the butter aside. In the bowl of your electric mixer, combine the cream cheese, mascarpone and cheddar cheese. Beat until combined, then add in the almonds, sage leaves, remaining butter, salt and pepper. Mix on low speed until combined, about 1 minute, scraping down the sides and the bottom if needed. Take the cheese mixture out of the bowl and mold it into a big ball as best you can. Roll it in plastic wrap and place it in the fridge for 30 minutes. Meanwhile, place the arils on a paper towel and pat them completely dry. Let them sit out while the cheese is chilling to remove as much liquid from them as possible. This will keep the cheeseball pretty! After 30 minutes, mold the cheese into more of a smooth ball. Add the arils to a plate or baking sheet and roll the ball through them, using your hands to press arils into all the cracks and crevices. You will need to gently press so the arils adhere to the cheese. 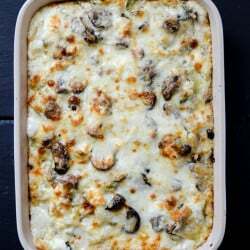 At this time, you can serve it immediately or keep it in the fridge until ready to use. If you want to make it ahead of time, you can rolls the ball 1 to 2 days beforehand. 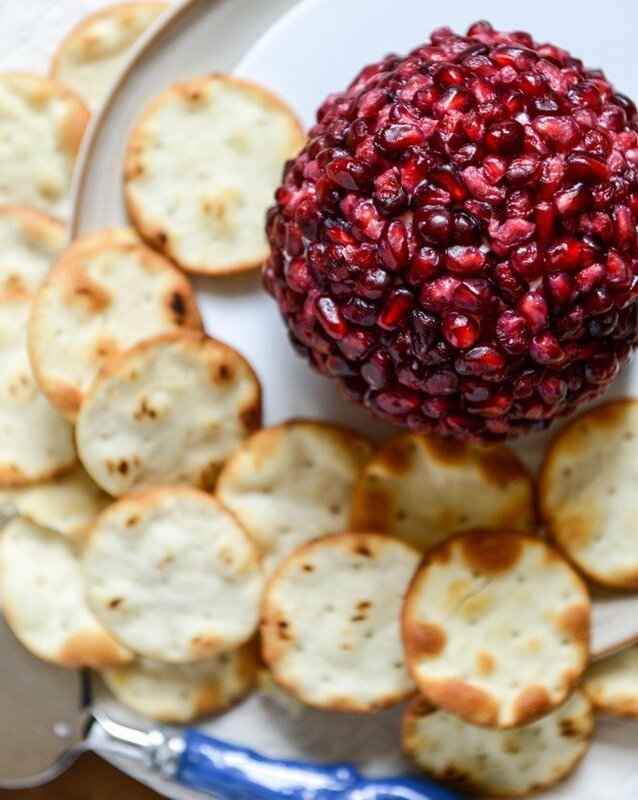 I’d wait until the night before or morning of to add the pomegranate arils, and you may need to let the cheese come to room temp a bit so it’s sticky enough. Yeah. I did just put butter in cheese. That is just the new idea I was looking for. Thanks you. These mini cheeseballs are so adorable! I love that you used BD’s smokehouse almonds to coat them. Such a great idea! These are perfect for the holidays! I made this several years ago, and it turned out great and was a big hit before my friend’s Christmas dinner! But I can’t remember if I used the honey roasted almonds from Trader Joe’s, or just got plain ones. If I use the honey roasted almonds, do I still need to toast them?